Gear up for hunting season when A&E®'s Country Buck$™: Season 1 arrives on DVD June 16th from Lionsgate Home Entertainment. 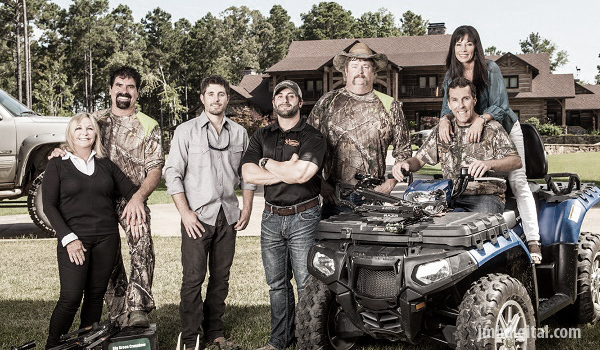 From the network that brought you Duck Dynasty®, get ready for the Busbices, the next big, American, outdoor-loving family, as they create gadgets for their wildly successful high-tech hunting business. Featuring a cameo by none other than Duck Dynasty® star Willie Robertson, the Country Buck$™: Season 1 DVD includes all eight episodes of the debut season and over ten minutes of never-before-seen-on-TV bonus content. Country Buck$™: Season 1 will be available on DVD. Owners of a 55,000-acre ranch and a prosperous hunting gear company - with goods ranging from deer feed to archery weapons - the Busbice family and their crew aren't just a few Louisiana good ole boys; they're a multimillion-dollar team. Kick back and enjoy the good old-fashioned antics of this fun-loving American family, whether they're tinkering with their latest gadget, taste testing deer feed or out on a hunting trip with family friend Willie Robertson.